I made this little picture using an acorn and leaves. The circles were made by the edges of the acorn cap! 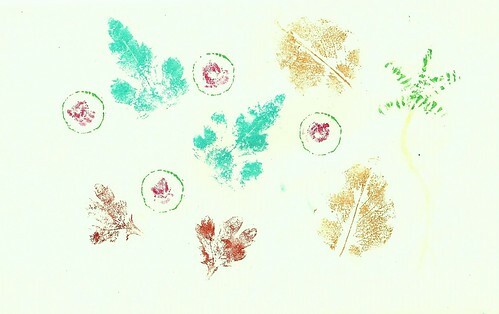 I think with more time and care, I could make some really lovely leaf prints. 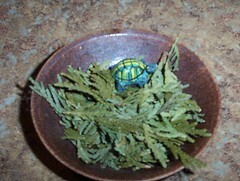 Here are my results for the little photo scavenger hunt! 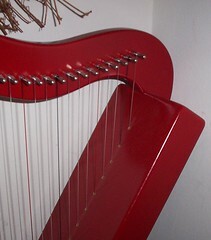 Here’s the neck of my little red harp. There’s a lot of softness going on here. 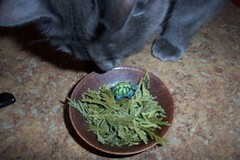 And finally some cedar tips that smell like wonderful trees (with tiny turtle friend). For the weaving quest, I first tried one of those circles of cardboard with notches cut in it. I guess I created a pretty sloppy loom and the end result was…not great. There is something about the whole idea of weaving that I love. I’ve never had the opportunity to try one of those big looms (shuttle looms? ), but someday I will. I’ve often been tempted to get a table-top loom. 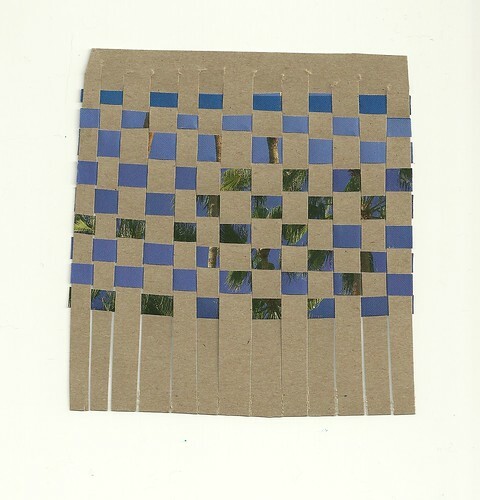 Anyway, my little circular weaving didn’t thrill me, so I did a little paper weaving. 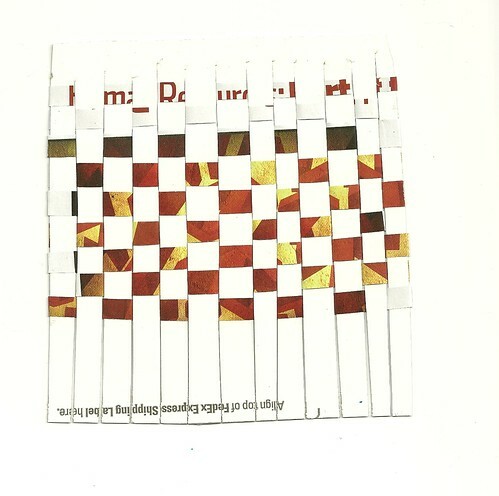 I made it using a piece of a FedEx envelope and a picture from a magazine. It reminds me of a grass skirt. 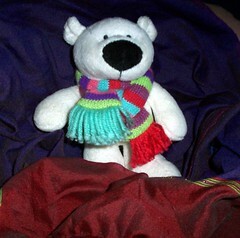 When I turned it over, I was happily surprised by the colors on the other side, too! 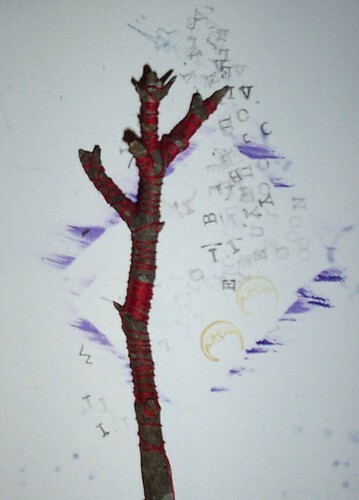 But I did gather some sticks and then…wrapped red string around one?!? It’s weird and I don’t know what to say about it, but it’s all I’ve got. I can say, though, that there is something therapeutic about wrapping string around and around a stick. and build a small structure of any kind. I spent some time this afternoon with dirt on my hands. It’s time to part with all my potted plants/container gardens in preparation for autumn and then winter. I had to dig my hands deep into pots of soil to uproot these plant-friends, which are now going to live with someone else. I thought about this dirt quest and I worked. It was interesting to see the difference in the dirt with well-drained pots and the ones that really couldn’t drain enough. Also interesting to see what little creatures lived in each! It amazing how root systems can turn soft, crumbly dirt into a strong, solid mass! 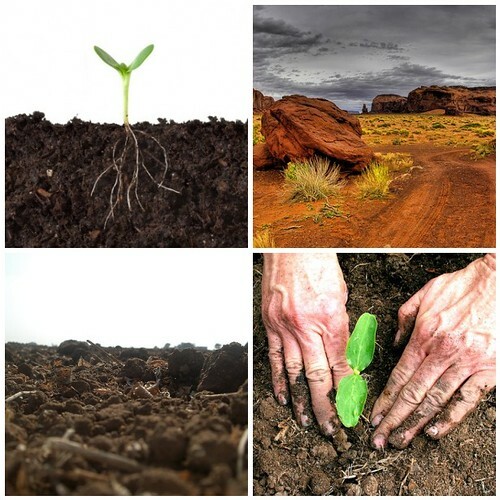 Dirt is a word we use for all kinds of things we want to get rid of, but of course our food comes from dirt, dirt holds us up as we walk, and many little beings live right there in the dirt. So…those are some of my thoughts today. It’s a good day to appreciate dirt.